“Daily Quota”: I try to complete four basic tasks every day- the basic M.O. to keep the gapingvoid ship afloat. I try to spend the major chunk of time working on the “Cube Grenades” every day. That’s probably the hardest part of the job. They take forever to draw and because paying clients are involved, you have to be on the ball. Luckily, all those years working in ad agencies trained me well for it. The Daily Bizcard. I’ve only been doing these a week or so but it’s been a lot of fun so far. I like how it allows me to both (A) create new work and (B) interact in a new, interesting, unique way with friends and colleagues. I think this will end up being a major, long-term project of mine. The Newsletter cartoons. Because these are also being turned into fine art prints, I take a lot of care with them. This is the second biggest part of the day, after cube grenades. Three hundred words. With a successful book already out, another book on the way, and a third book slowly simmering in the back of my head, the author gig is increasingly important to me. 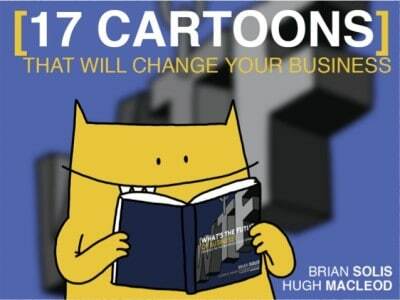 I’m fortunate that my publishers likes my basic working format- Approx 18K words and a hundred or so cartoons- which means that the books are relatively short to write, compared to most business titles out there. I try to do 300 words a day. 18K words takes 60 days at that rate. As I throw away a lot of what I write, that’s not enough for a book, but it’s enough to get the ball good n’ rolling. Three hundred words per day is pretty manageable if you’re feeling in the groove. If you’re not feeling it, then it’s complete torture. Sometimes I’ll go weeks without writing much, but then an idea will hit me, and I’ll go after it like a crazy dog. 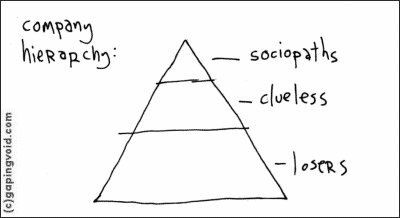 This diagram is a fairly simplistic version of reality, of course. Like Robbie Burns said, “the best laid plans of mice and men, often go awry”. Some days I’ll cover all four bases, sometimes just one or two, depending on what’s hitting the fan that day [Cube Grenade deadlines will always take priority, end of story]. The map is not the terrain, but as a map, this diagram is a good starting point every morning, while I’m drinking my first cup of coffee, trying to get my day started. be yourself. remembering what’s important. Oh that breakthrough moment where I throw the To Do bullet points away for clouds and thick black textas! 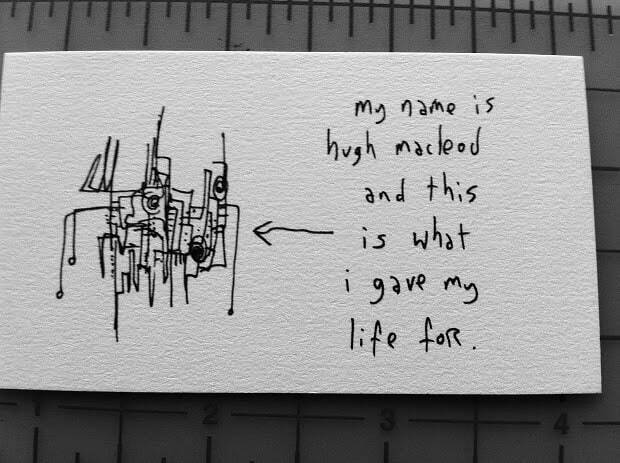 Thanks Hugh. The simplicity of this, as far as “to-do” lists goes… is awesome. I tend to start my day with a detailed list of loads of stuff – having just a handful of core activities would be great. I also admire the consistency of your biz – my work is much more … reactive and project based. saludos desde CHILE HUGH . empece hace poco a leer un libro tuyo de (empresa activa ) y lo encontré muy entretenido y asertivo . Cool, Hugh. Good stuff. 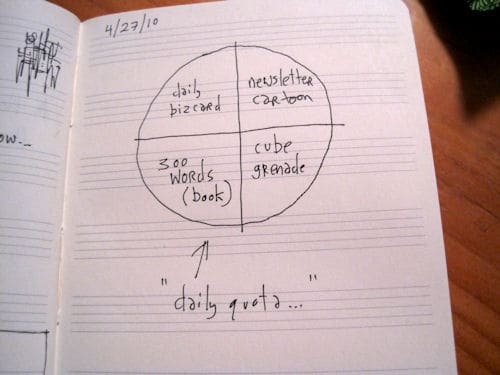 I like quadrants. I’ve used the same initial approach for screenplay concepts… actually, then I divvy up the quadrants, and fill them in with scenes. It brings to mind the saying, “Begin with the end in mind,” and then you roll out ideas according to constraints; i.e., what things need to happen to turn this thought into a story–and make it work within an hour and 30 minutes or what have you. 🙂 Good idea, to apply it to the work day.